Biting into a rotten piece of fruit or meat is a thoroughly unpleasant experience. According to a 40-year-old theory, it's because microbes have evolved to taste disgusting as a way to fend off competitors — namely you. But proving this theory has been difficult, until now. Back in 1977, ecologist Daniel Janzen proposed the idea that microbes are trying to make rotting foods unappetizing to large animals as quickly as possible. They do this by producing awful tasting compounds, allowing them to keep the entire meal to themselves. Fruits rot, seeds mould, and meat spoils because microbes gain a selective advantage if they can alter the properties of these crucial resources to avoid losing them to competing animals. It's a great theory, but one that's turned out to be surprisingly difficult to prove. The problem is that, if microbes put extra work into spoiling food for large vertebrates, they would be outcompeted by other microbes that didn't go to all the trouble. It would be a tremendous drain on resources, and not evolutionarily advantageous. "In our original model pretty much any microbe could arrive anywhere," [says Wilkinson]. That meant that any rotting fruit would likely be colonized by all kinds of microorganisms. In that scenario, microbes that evolved to spoil food would always be outcompeted by microbes that just reaped the benefits without investing in spoiling the food themselves. "In the new model they do not move quite as easily and that is the crucial biological difference." The new model predicts that "even in the extreme case where there is a very high cost to spoilage … spoiling microbes can be sustained," the authors write online today in the Proceedings of the Royal Society B. 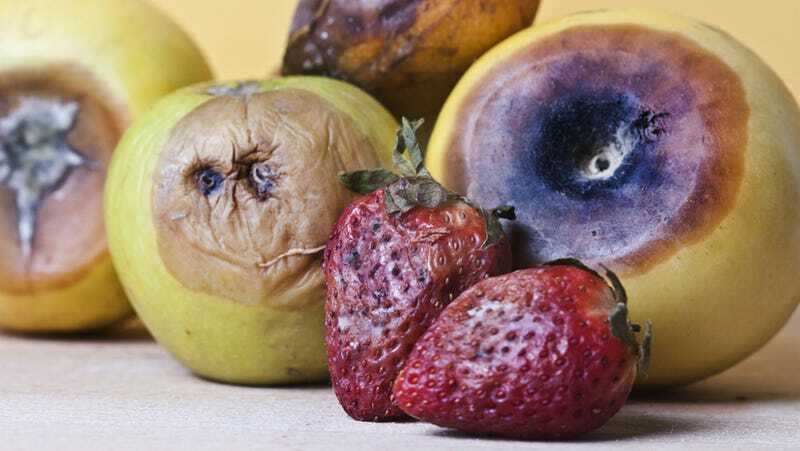 In essence, the old model viewed rotting fruit as a buffet with all kinds of microbes in attendance, explains Michael Kaspari, a biologist at the University of Oklahoma, Norman, who was not involved in the work. "The poisoner, taking the time to [spoil the food for large animals] while everybody else is stuffing their mouths, gained little advantage," he writes in an e-mail. "The new model allowed for the more realistic possibility that if the poisoner gets to the party first, it can keep everybody else at bay. As long as there are enough parties, poisoners prosper." The early bird — or in this case, the early microbe — gets to spoil the worm. Read Kupferschmidt's entire article. And check out the entire study at Proceedings of the Royal Society B: "Why fruit rots: theoretical support for Janzen's theory of microbe–macrobe competition."